2016 marks a turning point for Sleep: Magniflex is offering Smartech, a futuristic sleep system combining comfort and technology in order to comprehend what a good night’s sleep really mean. Smartech is a patented innovative complete bed system composed of mattress, bed base and integrated app for data evaluation. With Smartech you are finally able to observe and analyse your sleep, in order to deeply understand patterns and improve the quality of your sleep by following suggestions given by the system day after day. This app enables to display all the data (to one person or more people) in real time, to produce statistics ratings and to check the general trends of each parameter, besides programming brilliance of the room with consequent chromotherapeutic benefits and it sets up angle and massage-movements of the bed. Thanks to the ICARE function it is also possible to remotely control of the quality of sleep of your loved ones. Using a dedicated application or directly on the web-site reserved area, it is possible to keep under control quality, length and trends of your sleep. The Local Real Time function enables instead to control in real time parameters relevant to your own sleep as well as the surrounding environment. alarm clock – you can plan different kinds of alarm clocks, from the classic ringtone, to the softer with gradual awakening (position change, vibration, chromotherapy…). Awareness means we can intervene, especially during those phases of life in which we are not normally conscious of what happens around us. During sleep, even when it is not possible to be “alert”, our body reacts to the environment by sweating, moving, altering respiratory rate. It may happen, for example, that Smartech detects substantial differences between the temperature of the body and of the bed, hence a simple suggestion by the app to adjust blankets, clearly improves your sleep and therefore the quality of your life. It is just a simple example but there are a lot of cases in which knowing means being able to improve. 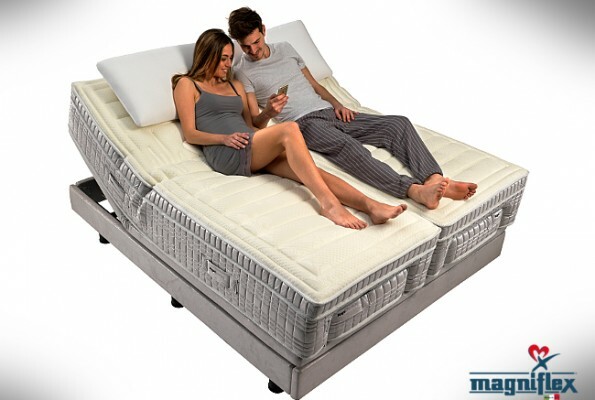 it is the only system completely Made in Magniflex, world leader in high end sleep systems.